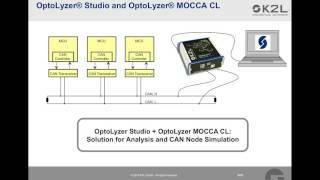 The OptoLyzer Studio Foundation is a comprehensive test and analysis software for CAN(-FD), LIN, MOST, FlexRay and Ethernet. The software offers message tracing, graphs, activities, filtering, message injection, bookmarks and support for many protocols. 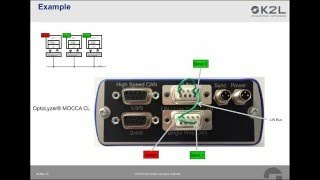 CAN (Controller Area Network) has been an ISO standard for over 20 years and is still one of the most prominent automotive network technologies today. It can also be found in a large variety of application domains outside of automotive like industrial, building technology and medical. This video will explain CAN fundamentals and show a practical example that is analyzed with the help of development tools from K2L. The analysis framework in K2L's OptoLyzer Studio allows to extract audio streams from captured AVTP traces. These examples show how to access OptoLyzer MOCCA hardware interfaces from within custom C# programs with the help of the K2L.Bus API. K2L.Bus is part of the OptoLyzer Studio installation. Contains OptoLyzer Studio (V1.6.0), K2L USB Driver (V9.6.1.0), Firmware (V4.16.03.14), LAN FW (V2.0.2.0) and Flasher (V6.3.2).